Not many people know much about Armenia other than the fact that the Kardashians and Cher hailed from this tiny country of 2.9 million. Armenia plays a unique geographical position at the crossroads of Iran, Turkey and Georgia. A quick Google search will tell you that many people are confused about Armenia’s location with questions like ‘Is Armenia in Europe or Asia?’. Armenia is essentially in Asia; the Armenians are considered Caucasian because they lost their most important lands and have a shared history with Azerbaijan and Georgia as being part of the Caucasus region. Caught between the collapsing Russian and Ottoman Empires, the region that was once known the Armenian highland, now eastern Anatolia, lost nearly all its Armenians within a dec­ade of the start of World War I. It was estimated that 500,000 to 1.5 million of them were killed or displaced in what Armenians call the Armenian genocide, a claim rejected by Turkey and many other countries. Due to its tragic past, it is an unusual destination with some of the oldest relics and cathedrals in the world marked by Soviet architecture and the first country to adopt Christianity. Starting from Tatev monastery, we decided to take a road trip to Yerevan to visit the best places that people rarely visit in Armenia. Two friends that we met in Iran had already made headway and were in Armenia and were tasked with organising the logistics / car rental. Here’s an itinerary of what to expect and see in Armenia, a tiny Caucasus nation. 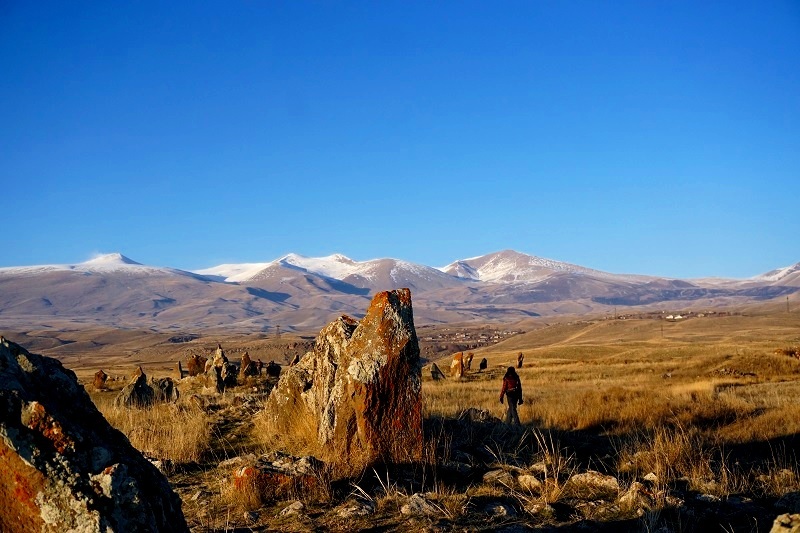 Travelling by car is a great way to visit many off the beaten sites in Armenia and even camp along the way but getting to these places can be difficult. We found the best places to visit in Armenia was by car. You can rent a car in Yerevan, Armenia and split the cost evenly among your friends. For one week, four of us rented a 4x4 Nissan X-Trail. It costs 8,200AMD ($17) per day for fuel and car rental at 19,000AMD ($40) per day. The total costs for 7 days is $400, which comes up to $100 per person. We traced the Southern countryside of Armenia in Winter, in the month of November covering Goris-Sisian-Ashotovan-Sisian-Martuni-Lake Sevan-Dilijan-Mount Ararat Province-Yerevan. Here’s my trip highlights and the many things that you can do in the Southern Armenian stretches. ﻿On an overland journey from Iran on to the Caucasus, we reached the Armenian-Iran border in Noruz, and headed towards Meghri, a town which balances the East and West with crumbling buildings and much of it replaced by Soviet architecture. It was hard to get a ride and I remember paying about $10 to $15 to get a black taxi. From Meghri, we headed towards Kapan, the largest city in Southern Armenia that is known to be wedged between the mountains. Lonely Planet states that the name itself is derived from the Armenian word kapel (to lock), signifying the interlocking mountain chains that converge here. It is known for its pink Soviet apartment blocks and stunning mountain scenery. However, we felt quite the opposite. The old soviet derelict buildings and a Nokia shop stood frozen in time. The weather was cold, gloomy and depressing, and there was nothing much to do other than seek refuge in our hotel so we ended up staying in the Golden Kapan Hotel which looked like an ashtray, been sadly left to rot away. Also Read: Overland Adventure: From Iran to Europe: How I travelled to 6 countries under $1,800? ﻿Winter was a dismal season for transportation in Armenia. We took a mini bus (Marshrutka) that dropped us in the middle of nowhere. The jagged edges of the mountains had cut into the sky. It was a creepy, damned place and the abandoned streets and nameless shops in a white-washed winter town didn’t help. With spotty GPS and blinding snow, it was hard to make out where we were heading towards. Not a soul in sight, we turned in circles, peeped through windows and wondered if people had left this town for the dead. We finally saw an obscure sign which looked like what could be the “Wings of Tatev”. We made a turn and trekked upwards towards the Cable Car station after what seemed like an endless 20 minute trek ascending those steep roads. 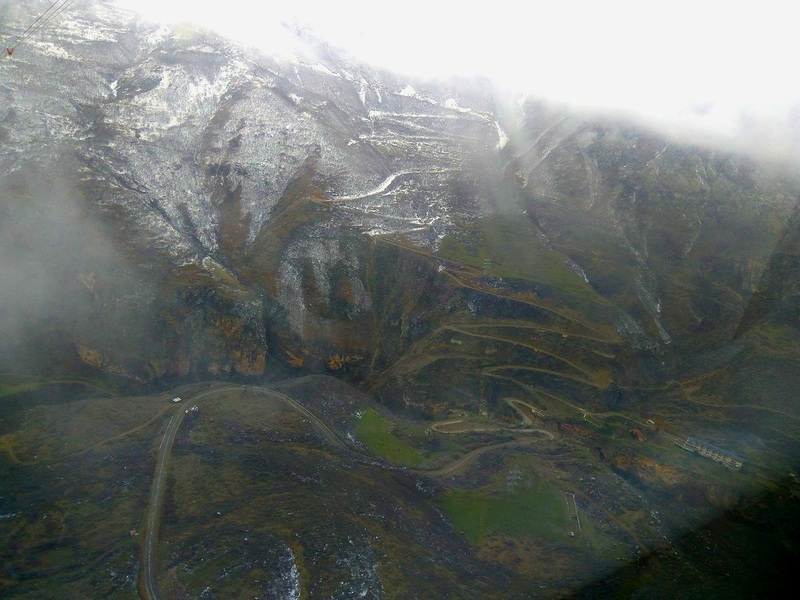 At the Wings of Tatev ropeway station, the view was known to be magnificent and all that we could see through our frosty windows were the Devil’s Bridge and the 25 hairpin bends. Standing on the edge of the deep gorge at the Vorotan river stands the remote monastery complex, Tatev Monastery. In Winter, the medieval monastery looked like a grim place to be stranded. The monastery was built in the 9th century and serves as a university as well, making it one of the most historically significant place to visit in Armenia. At that time, it was the largest centre of philosophy and science of medieval Armenia. As we finished devouring the sights of the huge complex, our modern ride illuminated in contrast against the dark and drab surroundings. A welcome relief after days and hours of misadventures. Our Nissan X-trail ride for the next few days in Armenia. Just as we left the grey skies, the skies changed course and brought in a stunning streak of blue, and we saw a signposted turn to Harjis. Long stretches of black asphalt roads shone in the afternoon sun and an elevated tiny church rose in the horizon. It was a stark contrast to the semi-dark buildings we saw earlier. We also noticed there were remnants of a 13th century church and wondered if it was safe for us to make a dash up across this ice-age settlement. We decided against it and trudged about staring at the emptiness and vast stretches of ice fields. According to researchers, Zorats Karer could be among the world's oldest astronomical observatories, and is at least 3,500 years older than British Stonehenge. The researchers also realised that several stones were used to make observations of the sun, moon and stars. Until today, many people continue to visit the site searching for answers related to astronomy. People bring along their telescopes and choose the dates which are the best to observe planets, the moon, and star. Others were abandoned derelict factory buildings and the grim, dormitory blocks surrounded by rusting oil tanks and rickety machinery overgrown with shrubs. Coupled with the cemeteries and churches, the town had a certain edge and eeriness to the mountain village. You can’t help but wonder what it was like for Armenians during the Soviet era and how the country tanked after 1.991. There were countless stories of the many monastic complexes and architectural finds that we found along our way. It was such a shame that we had no local to guide us through the interesting facets of our excursions, but with the help of Google, we found Vorotnavank to be one of the best and most interesting places. The complex is surrounded by a high stone wall for defense against foreign invasions and once housed workshops, stores, a seminary, resort, cemetery and an alms-house. It is surprising how a place as remote as this could be identified as a resort but guess this was how it was in 1000 A.D. The monastery overlooks a beautiful valley, and the churches are set in the middle of a cemetery. The ancient walls were built to defend the monastery from incursions and the loneliness of the surrounding landscape gives this place a warm feeling. It was nice to just wander in the dark rooms lit up by the rays of the sun coming in from the small peepholes. Time was definitely on our side, and with splendid views of the Spandaryan reservoir, we parked our car by the side and had a small picnic at an abandoned wooden cottage. The mornings that we had in our dungeon like hotel in Armenia was unlike any other morning. Our super kind host at Hotel Martuni prepared a breakfast spread for us filled with sausage cheese, buns, bagels, butter and jam. Just what we needed before stopping in for a grave break, the Noratus cemetery. Noratus cemetery was no ordinary cemetery. It was a work of art. It is home to the largest collection of impressive Khachkars (stones carved with crosses and floral motifs, were primarily seen as a symbol of salvation of the soul, either living or deceased) in the Republic of Armenia. The intricately carved cross stones are dotted across the landscape in an army-like fashion. What’s really interesting is that behind each cross stone, it tells a story about the person featuring details of their occupation, hobbies and what they did in life. The pictures on the cradle stone gives you an idea of what they were doing for a living, some were farmers and some were even musicians. ﻿Winding down the windows, we notice a speck of blue and the largest freshwater lake in the Caucasus. The mountain lake takes up 5% of Armenia's surface area and is about 2,000 meters above sea level. A lot of Armenians come here to enjoy the slow life and take in the beauty of the surroundings. I was told July and August is the best time to visit Lake Sevan in Armenia. However, in November, the weather felt right, it was windy and sunny, and had all the right elements to even witness an Armenian wedding at the Sevanavank Monastery. Known to be a famous resort town, Dilijan with its alpine meadows and deep forested valleys and mountains is a great way to kickback, relax and get some much-needed rest. 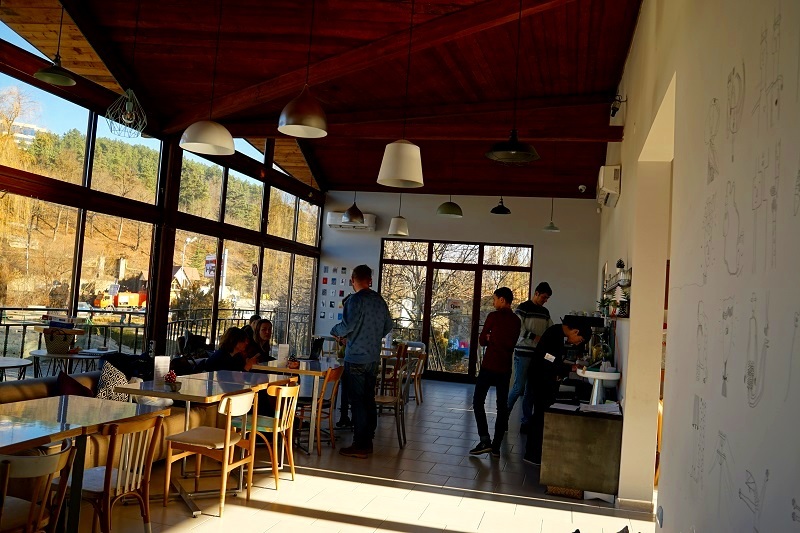 We decided to visit Cafe #2, a local initiative by youths of Armenia where all revenue goes back to the foundation for developing education and initiatives in the village. We were told about the center of the Culture and Food village in Byurakan, near Aaragat Mountains where there was a festival to showcase and provide insight into the local Armenian food and culture. The village is on the slope of the mountain in Argatsotn Province. We were invited to experience how Armenians make their noodles, their fresh kebabs, pilaf and baklava pastries, with side dishes of music and dance. Food was a constant topic of discussions for Armenians and it was hard to agree on what is authentically Armenian. We also visited a middle age fortress and church with pagan and christian decors. The dark churches and history conjures up images of Lord of The Rings set and gives you a glimpse into their orthodox religion and rituals. It also demonstrates the history and a fascinating exploration of the Middle Ages in medieval Armenia and shows the craftsmanship of the day. The canyon is believed to be formed millions of years ago and it was caused by volcanic eruptions. The cliffs may look like a massive pipe organ or a game of tetris but the site definitely would not have been impressive if it wasn’t for these peculiar formations and cooling and solidifying processes of the boiling lava. We also visited the Khosrov Forest State Reserve located in the mountainous terrain of central Armenia, that claims to be one of the oldest protected areas in the world. Leaving the ancient past and remote landscapes, we made way for the bustling city of Yerevan. The city was full of contradictions, a mix of old vs. new, with street chic cafes and an ancient rustic looking medieval Marriott Hotel. The city was walkable with endless dining and entertainment options. In a few decades, Yerevan was transformed from a provincial town within the Russian Empire to Armenia's principal cultural, artistic and an industrial centre. Why Do A Road Trip In the Caucasus? The Caucasus comprising of Armenia, Azerbaijan and Georgia is an interesting region to visit and easily tops as the region with the most unusual places and destinations. At least 50 different ethnic groups and nationalities make their homes in the region's isolated valleys and have managed to hold on their identities despite incursions by the Russian, Ottoman and Persian empires. Georgia, Armenia and Azerbaijian offer e-visa services for most countries making it quite easy to travel to these unique countries. For a great Caucasus road-trip comprising of the best places to visit in Armenia, you can follow my route or go ahead and cover three countries starting from Azerbaijan (Baku and Qabala) and making your way to Georgia (Kakheti, Tblisi and Gudauri) and then Armenia (Yerevan and Southern Armenia). Currently, Azerbaijan and Armenia have territorial disputes over the Nagorno-Karabakh region, and having an Armenian stamp on your passport would deny your access to Azerbaijan, hence it is important to decide your starting point for this trip if covering three countries is in your radar. If you’ve travelled to any of the Caucasus countries, tell me your experiences in the comments below.